Life is enjoyable and worth living when you treasure your precious moments. Photo printing is the quickest and simplest way to print photos from your phone or camera, stick them on the walls, and then sit back and enjoy your remarkable moments. Wallpics is an app developed specifically to help you treasure those life moments. It allows you to print your photos directly from your smartphone to the walls without any hassle. Wallpics is for people who are interested in displaying high definition pictures on their homes without damaging their walls. It is one of the best way to display your photos and still show your wall some love. Wallpics can help you make a statement on your walls by displaying the most treasured moments of your life in an extraordinary manner. The app can help you display your family memories on your walls in a personalized and simple manner with photo boards that perfectly stick to a wall with adhesive. With just a single tap, you can print photo tiles directly from your smartphone and showcase the pictures on your walls. You will definitely fall in love with these stylish boards. Once they are delivered to your home, you can mix tiles the way you wish and bring the walls in your house to life. Wallpics are personalized photo tiles designed to decorate and beautify your office or home walls with your best memories and warm amazing feelings. With these photo tiles, you can effortlessly create as many beautiful designs as you wish to add joy, style and love to your home or office. Home décor is now more fun than ever. For more details, you can check out the Wallpics website. How do you order Wallpics? Ordering Wallpics is very easy. Simply download Wallpics app from the App store. Now, select the photos you want to display from your phone and upload them to your Wallpics app. 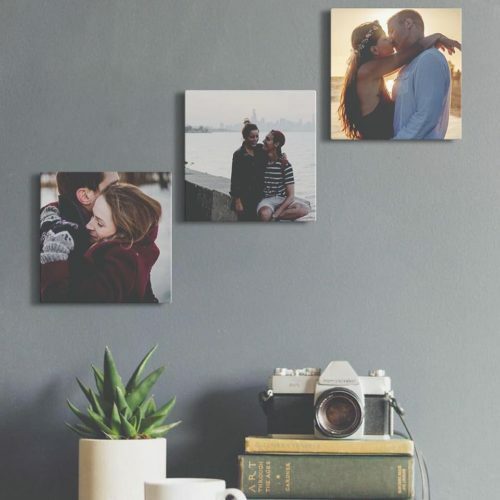 With just a single tap, your favorite photos will be delivered to your home within the shortest time possible, ready to bring a new life and love to your walls and home. How do Wallpics stick to the walls? Wallpics do not require screws, nails, or anything to stick to the wall. Therefore, they do not cause any damage to your walls. It is extremely easy to use. They are designed with sticky double-sided adhesives that neither peel off wall paint, nor leave any undesirable marks on the walls. You can change the order of your Wallpics or move them around repeatedly from room to room or wall to wall as you want without causing any damage to your walls. Choose your favorite photos, and Wallpics will do the rest. Display by simply sticking Wallpics to the walls. 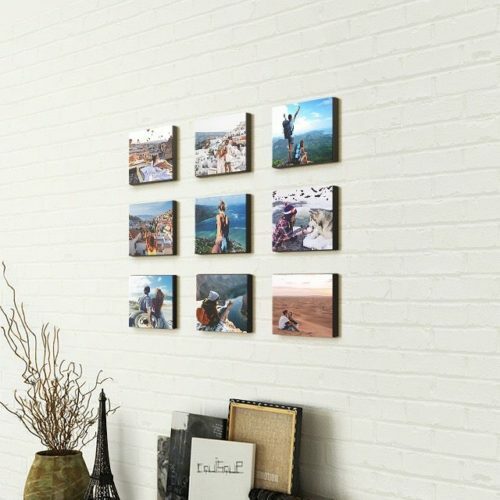 The 8×8 square photo boards are designed to stick on the wall easily with self-adhesive. You can move them around freely or change the order easily, without damaging your walls. -A set of three are US $29, and additional ones are US $9 each. If you are in the USA, you will receive your Wallpics within 6 working days from the time of placing your order. International shipping takes up to 14 working days from the time an order is placed. However, the main aim is to process and ship Wallpics within 48 hours from the time of receiving the order. 1. Start by uploading your best photos from your phone to Android or IOS app. 3. Wait for your order to arrive at your front door within 5 days. 4. Select the lucky wall and then place your Wallpics. Tap Wallpics gently on the wall in your preferred position. You can now enjoy your elegant memento. Your home will be warm and cozy. You will definitely love walking by and looking at your Wallpics as they will remind you of special moments. Download Wallpics app today and start creating your best Wall Pic today! They make a perfect gift for your family and friends. You can checkout our Facebook page and Instagram to see how other people are already showing off their favorite photos. You will definitely find instant inspiration on how to go about creating awesome style with Wallpics. We care about making your walls look like home. Let us help you show love to them.